Choose the Best of France! Immerse yourself in the culture of the South of France in Autumn! 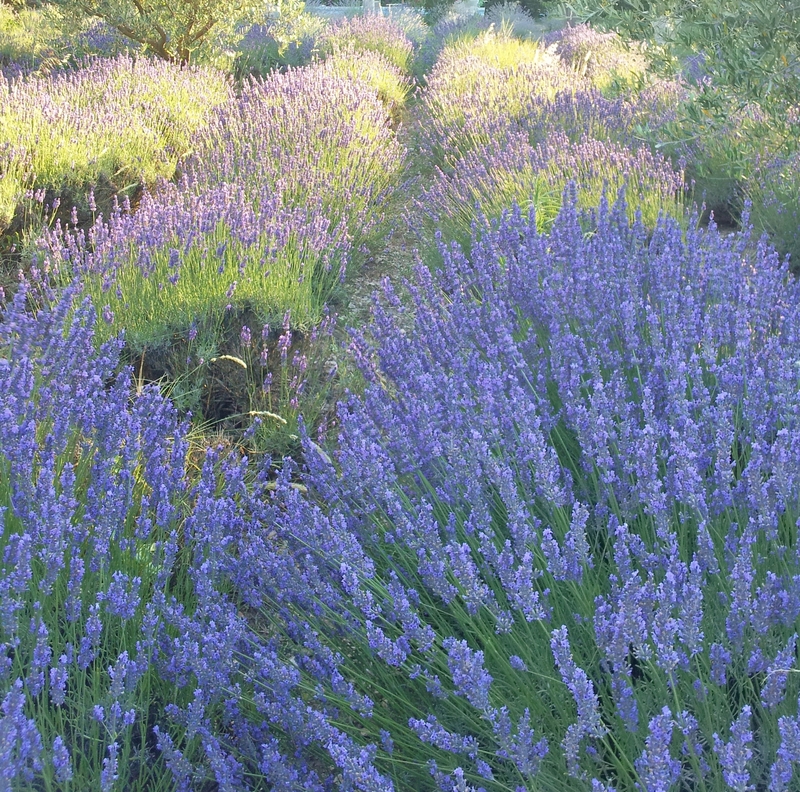 September is the perfect season to visit Provence and the Riviera. The weather is warm and sunny. School is back in session, so it is not crowded with vacationers and tourists! The skies are clear and blue and there are still lots of beautiful flowers. The vineyards are starting to turn autumn colors and the air is fresh. Enjoy 10 days of fun, relaxation, authentic French cuisine, and regional wines in a luxurious setting. We offer you 9 full days of luxurious travel to Provence and the Riviera! Six nights at the Number 1 rated hotel Mas des Carassins in St. Remy de Provence: Gardens, swimming pools, fountains, and charming rooms. Three nights in Nice at our four star boutique hotel Le Grimaldi. Delicious buffet breakfast every morning at both hotels: homemade jams, local honeys, fruits, cheeses, meats, choices of different fresh squeezed juices, trays of fresh baked breads and croissants, eggs, and more! Cooking School Lesson with Yvan Cadiou in his whimsical kitchen at a country estate. Learn how to prepare 5 different dishes. Assist Yvan with picking fresh herbs and vegetables from his garden to complete the recipes. Besides being an amazing and creative chef, Yvan is highly entertaining. Delightful lunch will be served in the garden with some very special regional wines. You will never want to leave! Visit Roussillon on market day and take a walk through the Ochre Trails. This village is designated as one of the most beautiful villages in France. Visit the Camargue and the walled city of Aigues-Mortes with a tour of the ramparts surrounding the medieval city. Owner, Carol Etheridge, accompanies each tour. All tips for guides and our luxury coach bus drivers are included. Pre-Travel Information Booklet to help prepare you for your travels. Day 1 – Welcome to France! We will meet you in Nice to begin our adventure in the South of France. 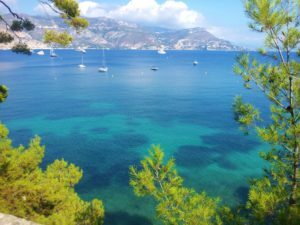 Enjoy a beautiful, leisurely ride in our luxury coach bus past Mediterranean landscapes, through the hilly, rocky Var region into the heart of Provence. When we arrive at our hotel in St. Remy you will have time to settle in and unpack, take a walk around the gorgeous gardens, or have a refreshing dip in one of the two swimming pools on the grounds. This evening we will have a welcome gathering in the garden and our first five course dinner prepared by the fabulous chef at the Mas. First comes an “Amuse Bouche” which is always a surprise. Next is the “Entrée” or appetizer course. This course is based on a principal ingredient and includes three variations around the theme. It could be melon, or tomato, or zucchini in the form of a chilled soup, a sorbet and crème brulee. Next comes the ”plat principal” which is the main dish. Afterwards you will be served the cheese course, then dessert. 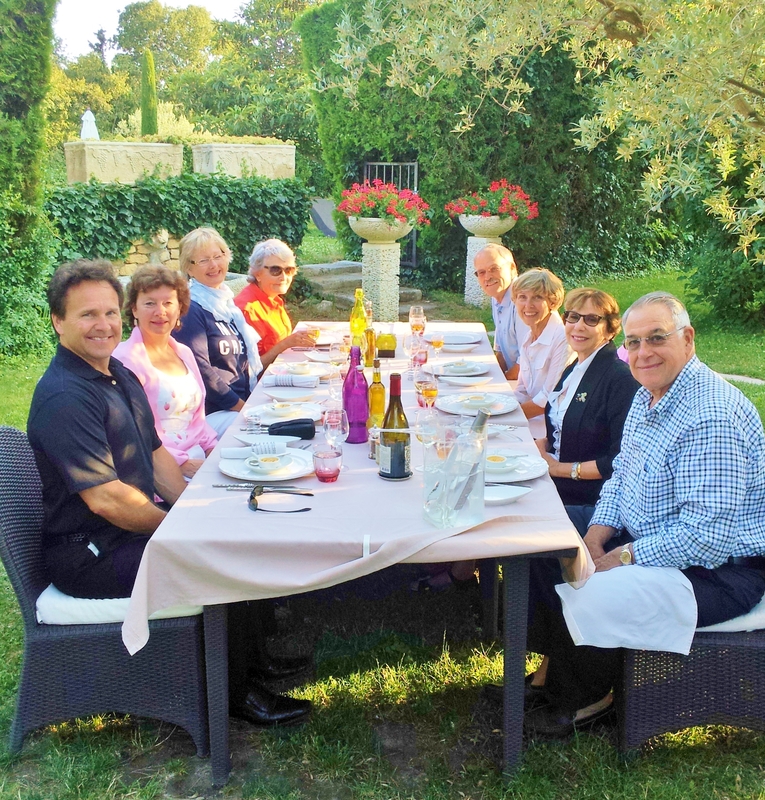 It is an event each evening and most nights the weather is perfect for dining in the garden. Day 2 – After breakfast we will walk to the famous archeological site, the City of Glanum. Our very knowledgeable guide will explain the history of this fascinating site which was settled by Celtic Ligurians, Greeks, and then the Romans. After our visit of Glanum we will walk to St. Paul de Mausole, the hospital where Van Gogh admitted himself as a patient and stayed here for more than a year. This was a prolific phase of Van Gogh’s career. He completed over 150 paintings and drawing, including several of his room and the hospital buildings, “Starry Night”, and many different views of the surrounding landscapes. After our visit to St. Paul de Mausole you will have a free afternoon in St. Remy. Enjoy lunch at one of the many cafes or restaurants in St. Remy, visit the Musee des Alpilles, browse the charming boutiques, and explore the town. Day 3 – Today we will drive south through the Camargue region. Look for the famous black bulls and the beautiful white horses used by Camargue cowboys. Our destination is Aigues Mortes, a medieval walled city and site of the 13th Century seaport constructed by King Louis IX for his departing crusaders. Walk around the ramparts to get the best view of the surrounding landscape, the ancient towers, and a panoramic view of the cité. We will visit the Domaine Royal Jarras vineyards followed by a tasting of their award winning wines. Mid-afternoon return to St. Remy and free time before dinner. Day 4 – Market day in St. Remy! Start the day at the beautiful Provencal market in St. Remy de Provence. If you get up with the birds, you can watch the market setting up. It’s really quite a sight to see…and hear and smell! The artistry with which the vendors display their wares is amazing. You will find everything at this market from French music CDs, original paintings, clothes, lavender products, wine, honey, candy, toys, Provencal linens and crafts, as well as every conceivable food product of the region. There is live music to be enjoyed throughout the market place. Enjoy your morning and explore the town. The market ends around 12h30, so don’t get there too late! Be sure and find the band “Gig Street” who play in the center of town. This is a group that is not to be missed! Day 5 – Today we will drive into the Luberon, land of Peter Mayle stories, to the hilltop village of Roussillon, which is listed as “one of the most beautiful villages of France”. A village of intense color! Over 17 different shades of ochre tint the buildings in colors ranging from golden yellow to deep red. We begin with a short walk of the Ochre Trails. Wear good shoes and white is not recommended unless you want to change the color of your shoes! Afterwards there is a small market in the village. This is a typical small village market, but has many interesting vendors and artisans. Enjoy lunch in one of the charming cafes in Roussillon. After lunch we will drive to Gordes, also designated as one of the most beautiful villages in France. Enjoy the panorama of the valley and mountains of Luberon. Afternoon return to St. Remy and free time before dinner. Day 6- Today is our cooking lesson located on a beautiful country estate. Our fabulously entertaining chef will welcome us in his home to teach us how to make 5 different dishes. Pick fresh herbs and vegetables in the garden and assist with the preparation of these delicious recipes. We will dine on Chef Yvan Cadiou’s creations (with our help!) in the garden under the shade of 3oo year old plane trees. With lunch you will have the opportunity to taste some very special wines from the region. 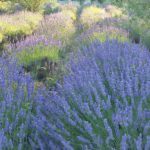 Take your time and relax and soak up Provence! We will of course finish off with dessert, digestif and coffee…Our chef has produced many different cooking shows, cook books and continues to write a weekly column in the Marseille newspaper. You will be delighted with the lesson, the setting, the meal, and the hospitality! 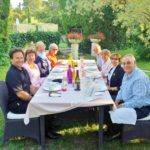 Day 7 – After one last delicious breakfast in the garden of the Mas des Carassins, we will check out of our lovely inn and drive through the Alpilles mountains to visit Les Baux de Provence. Les Baux is an extraordinary village that blends with the jagged spur of rock on which it is perched. The dramatic scenery and historic ruins draw visitors from around the world. Les Baux was once the seat of the most powerful (and fearsome!) lords of this region. Some claimed to have descended from the Magi king, Balthazar. Tour the chateau and ramparts, participate in the catapult demonstration, shop in artist ateliers and specialty boutiques. Sit on a café terrace overlooking the sheer cliffs and twisted rocks of the Val d’Enfer (Valley of Hell) which was the inspiration for Dante’s description of the Inferno. This afternoon we will head back to Nice for three days on the Riviera! Check in at the hotel and orientation walk around old Nice. Free for dinner on your own this evening. Day 8 – This morning we will have a beautiful and exciting drive to Eze, the highest perched village on the Riviera at 1,407 feet above the sea. We will start with a visit to Fragonard, the famous perfume maker for centuries. After the visit of the perfumery, we will go to the village ofEze. Begin with the exotic garden at the top of the village with more spectacular views of the Mediterranean. At the top of the gardens you will find the ruins of the chateau that Louis XIV had dismantled in 1706. Take lots of pictures in Eze. It is very picturesque and you will be thrilled with the results. In the afternoon we will visit the Villa Ephrussi de Rothschild, the finest villa on the Riviera. Seventeen acres of gardens and fountains surround the Belle Époque villa, which houses the art and antique collection of the Baroness Ephrussi de Rothschild. Late afternoon return to Nice and dinner on your own. Day 10 – End of Tour today. We will arrange transportation to the airport for each traveler’s continuing journey. Transfers provided to accommodate YOUR SCHEDULE! A delicious hearty buffet breakfast is included every day at our hotels. 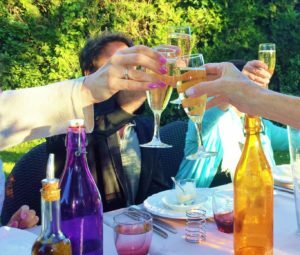 A scrumptious five course dinner is included every evening at our inn, Le Mas des Carassins. Nice – Artist Robles and customers!